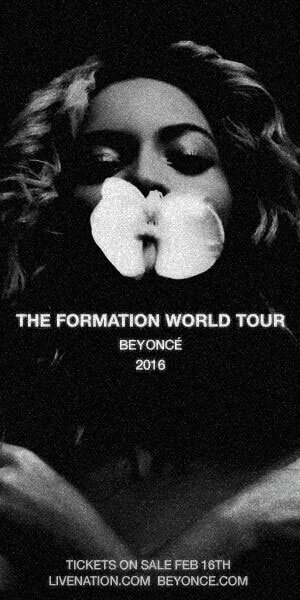 Over one million tickets have been sold since Beyoncé announced her The Formation World Tour on Super Bowl Sunday and today she’s announced additional dates have been added to the 2016 world tour. Among the concerts dates that have already sold out are stops in London, Sunderland, Manchester, Amsterdam, Dublin, Stockholm, Miami, Dallas, Toronto, Chicago, Boston, Philadelphia, Baltimore, Los Angeles, and New York City, according to Live Nation. In response to the demand for tickets, Beyoncé’s added second shows in Chicago and London’s Wembly Stadium. Although nothing official’s been confirmed, it’s likely additional dates will be added in the coming months. The Formation Tour marks the Grammy winner’s first solo tour since 2013’s Mrs. Carter Show World Tour. For info on purchasing tickets, visit www.livenation.com.